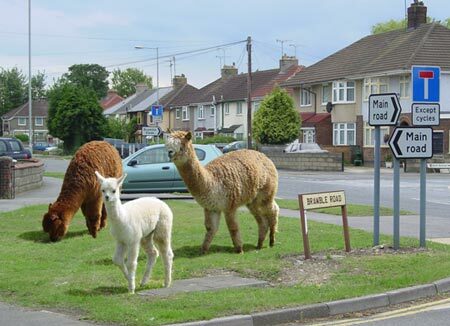 Swindon's urban landscape is home to much varied and fantastic wildlife but none so curious as the so-called Elgin Llamas, the only remaining survivors of the extremely rare sub-species of the Camelid family known as llama urbania. Swindon is home to 28 of these curious creatures, the only branch of the camelid family that have adapted to the urban environment, and they are all the direct descendents of the original llamas brought to England from Peru in 1841 by Thomas Bruce, the Seventh Earl of Elgin. The Elgin Llamas in pensive mood. in the world' and he immediately made plans, through long force of habit, to have them removed to England where British artists and scholars could study them at length without having to leave London. The Peruvian government issued Elgin with a licence to 'remove some fur and a toenail or two' from the much prized creatures, and within a few weeks he had shipped them all to England where he attempted to sell them for £500,000 to the British Government in order to 'cover his costs'. The Government, no longer eager to deal with Elgin after his previous and far more widely publicised looting in Greece, turned him down and the Earl was forced to recoup whatever he could, eventually accepting £25 and a return ticket to London from the Swindon City Council in 1843. 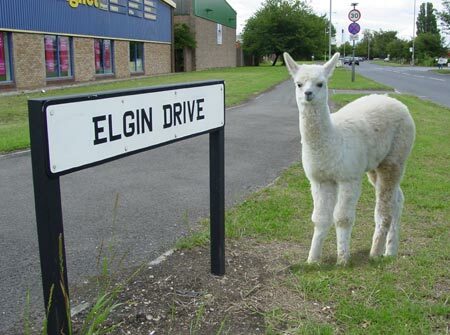 The llamas settled in well to their new environment and have happily continued to live and breed in the area of the city now named 'Elgin' in their honour. Currently the only examples of llama urbania living anywhere in the world, Swindon's llamas are now the subject of a heated debate: The Peruvian government is mounting a fresh attempt to have the llamas returned on the grounds that they were stolen in the first place. Swindon City Council is maintaining that they bought the llamas in good faith and -slightly more controversially- suggest that they would have been extinct long ago had it not been for Lord Elgin's noble zoological gesture. The llama is different to the alpaca mainly by virtue of its size - it can be as high as 5' at the shoulder. 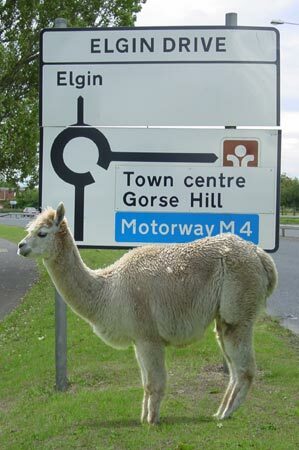 Visitor's Information: The Elgin Area of Swindon is just North of the railway line near the cathedral of St Zvlkx (site of) and the llamas can be easily seen, grazing on hedgerows, in people's gardens and on the roundabouts. By nature inqusitive, the llamas will happily approach strangers, be fed hay and have their pictures taken. They have their own dedicated warder who lives on Argyle Street.